Like we all know that both Apple Music and Spotify are streaming music service. There are still differences between both of them. Take for example, you can use the web browser to play Spotify music songs instead of installing the corresponding software. 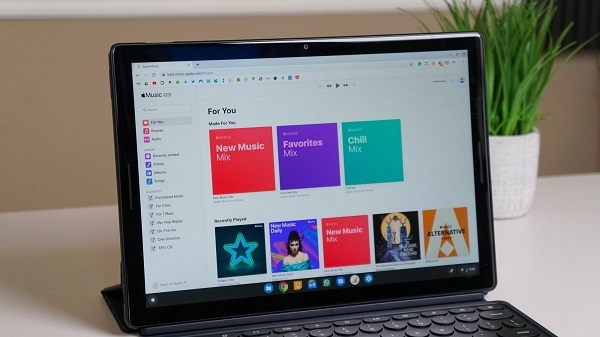 However Apple Music subscribers can only listen to music and discover new artists in the Music app on iPhone, iPad, iPod touch, Android phone, and Apple TV, or iTunes on your Mac and PC. Please don't worry. This article will list 2 solutions to help users to listen to Apple Music on the web player as you need. When he use the Apple Music tools website to search a playlist that isn’t available in search (like some playlist of Skam or Norwegian rap). And he noticed that the player design changed a bit and after listening to a song (preview mode of 30s). Firstly, go to visit Apple Music Marketing Tools webpage (https://tools.applemusic.com) via any web browser. According to your region select the country you live in and type the song/artist you want to listen to in the search box. Second, Upon clicking on any of the songs given there, Apple Music Player interface will open up. Third, now it starts playing the preview of the song. And if you would like to listen to the whole song, you need to click on the Sign in option on the top right side of the web music player and enter your credentials. Please make sure that you have the subscription of Apple Music to listen to Apple Music online. After logging in, you will be able to play full songs from the Apple Music Web player with ease. And there is no need to open iTunes app. 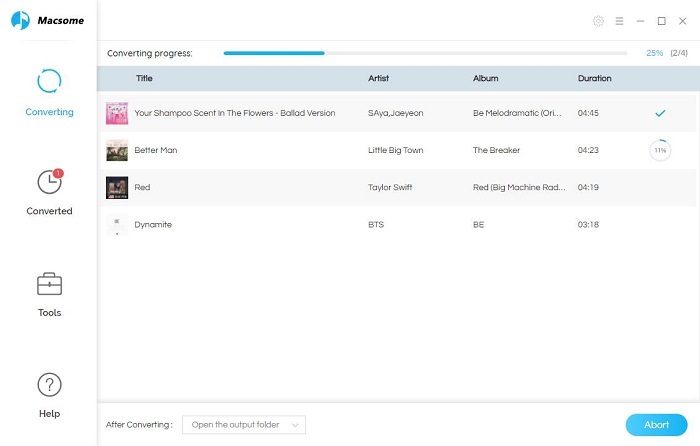 From the Method 1, users can play Apple Music songs with Apple ID from the Apple Music tools websites. Even you only want to play some one song, it seems useful. This can't allow users to you to browse the catalog, create playlists or see what your friends are playing. Besides, the embeddable music player isn't a full-blown iTunes replacement yet. Why not try to deal with Apple Music files and then we can play these Apple Music via any web player without iTunes limitations. As streaming music service, all the music files on Apple Music are limited with Apple FairPlay DRM protection. And this limitation also prevents you freely copy, transfer or backup Apple Music as you like. If you want to play Apple Music songs on any web player freely, you can get rid of DRM from Apple Music and convert them to audio formats that supported by the common web player. 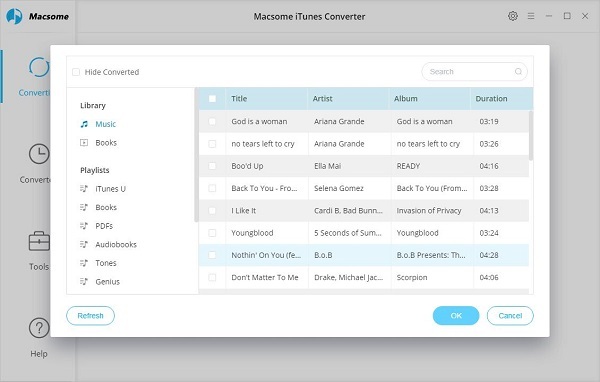 Here recommend you Macsome iTunes Converter, which is used to remove DRM from Apple Music files and convert Apple Music to MP3, AAC, FLAC and WAV format with fast speed. In the following, we will show you how to use Macsome iTunes Converter to remove DRM from purchased Audiobook or Apple Music files. 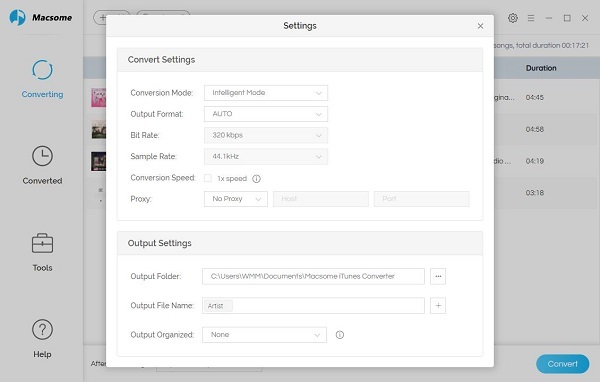 First, go to download and install the iTunes Converter on your PC, and run it. Second, click the button "+ " to choose Apple Music files you want to convert to add the audio files. After the conversion, all the converted Apple Music files are unprotected, and you can use any web player to play them.